Very precise loudspeaker placement can open up a whole new dimension in listening, so I will outline the system that is becoming the standard of the industry. This standardized listening room is a Golden Cuboid and is the model for the math used in this system. This method will work with any box speaker, in any reasonably sized rectangular room. You may find that you have already positioned your speakers this way by ear. Active nodes are the main concern when placing loudspeakers in a rectangular room. A node, or the frequency where loudspeakers and parallel walls interact, is proportional to the speaker to the wall distance. A secondary factor is the loudspeaker-to-loudspeaker time constant. When you use this Golden Ratio method to set your room up, the speakers are placed so the three nodes progress or differ from one another in Golden Ratio. This eliminates any unison or near unison resonance in the nodes. 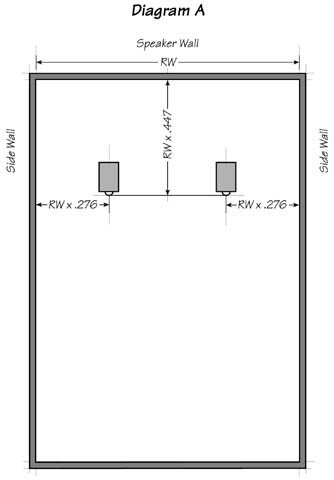 Panel or dipole loudspeakers such as Apogees and Magnepans cancel their side waves, so a formula of 0.618 x the ceiling height can be used for determining placement from the rear wall. Most box loudspeakers radiate low frequencies in all directions thus a formula that places the loudspeaker to rear wall distance at 1.618 the side wall distance should be used. This is all you need to know to place speakers in a symmetrical, rectangular room! In the near field position the speakers and the listener's head are the points of an equilateral triangle. Near field listening gives the perfect stereo field. It is frequently used in the recording studio to position the microphones and the voice in the mix. 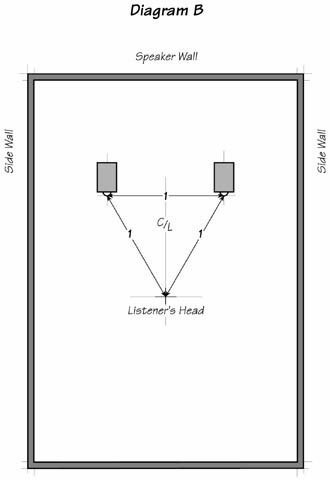 The near field listening position is determined by the "center to center" distance of the speakers and the distance to the listener's head. It does not refer to the room in any way. The importance of symmetrical speaker placement in a small room cannot be over emphasized. Once the speakers are set as close to perfect as possible, you must angle them slightly toward the listening position. This can be done by ear and usually a 1/4 to 1/2 inch tweak will do. Box speakers generally require a bit more toe-in than planar speakers. You will be able to hear a center focused voice clarify when the sweet spot is hit. See more Cardas loudspeaker setup articles at this link.